But once hearing Tricia's news, I knew that after mixing and kneading and tending and shaping and baking and tapping and buttering, I would deliver warm bread to a family raw with loss, gathering with memories, communing with tears and laughter, to mourn the loss and celebrate the life of their own mother. For my Mom, making bread was a way to feed her family and heal her soul while recovering from a radical mastectomy at only age 35. 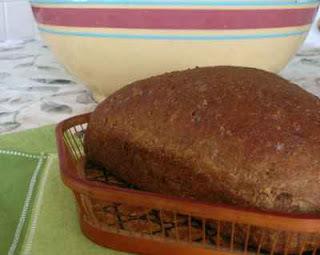 And when, many years later, she was sick with lung cancer and my family was caring for her, I too made bread, what we came to call Best-Ever Oatmeal Bread, first published in Kitchen Parade in 2002 but online now for the first time. Many of us are thinking about cancer-fighting foods this month. Mele Cotte, herself a survivor, is hosting an event called Cooking to Combat Cancer. This is my proud entry. SO WHAT IS KITCHEN PARADE? Kitchen Parade is the food column that my Mom started writing for our family newspaper when I was a baby. Today it's published in my hometown newspapers in suburban St. Louis and features 'fresh seasonal recipes for every-day healthful eating and occasional indulgences'. Kitchen Parade features recipes a modern cook can count on. All are thoroughly tested by a home cook in a home kitchen and many are family and reader favorites. All recipes feature easy-to-find ingredients, clear instructions and (because I'm passionate about informed food choices!) nutrition analysis and Weight Watchers points. Want to know more? Explore Kitchen Parade, including Kitchen Parade's Recipe Box!